Pradhan Mantri Jan Dhan Yojana - Saraswat Cooperative Bank Ltd.
CardlessCash Withdrawals at our ATMs! From Debit cards, to SMS banking and additional benefits from the Government of India, at zero balance requirement, the Jan Dhan Yojana has the best facilities to offer. Any branch banking and the inbuilt accident cover serve as the cherry on the cake for this exciting Saving scheme. Issuance of RuPay debit cards(AMC waiver for 1 st year) to individuals/joint accounts will be as per the existing practice applicable to Regular Savings account. The daily combined limit for RuPay card will be Rs 10000/- which will include cash withdrawal at ATM, POS and online. Direct benefit transfer to receive Govt.subsidies. Interest Rate applicable on PMJDY Savings Account is 4% p.a. with quarterly rest. A resident individual of above 10 years of age can open PMJDY Savings Account. No limit on the number of credit transactions during a month. Daily combined limit for RuPay debit card is Rs 10,000/- which includes cash withdrawal at ATM, usage at merchant establishment and e-commerce. No restrictions for Rupay debit card on the number of transactions at merchant establishment. No charges will be applicable for nonoperation of account or activation of an inoperative account. Cash withdrawal at Saraswat Bank ATMs will be free of charge. AMC waiver for 1st year on issuance of RuPay debit card. No charges for cash withdrawal at Saraswat bank ATM. Maximum of 4 debit transactions are allowed per month free of charge to the customers for cash withdrawals at branch. Thereafter, cash withdrawals at branch will be charged at Rs.10/- plus service tax per transaction. Free first 5 transactions (financial and nonfinancial) per calendar month on other Bank ATMs. Thereafter, transactions at other Bank ATMs for cash withdrawal will be charged at Rs. 20/- plus service tax and non-financial transaction will be charged at Rs. 10/- plus service tax. 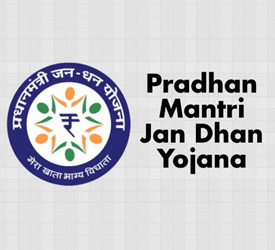 Holders of PMJDY Savings Account with one branch will not be eligible for opening another PMJDY Savings Account at any other branches of our Bank or with another Bank. If an individual has an existing live Savings Account (other than PMJDY) in our Bank then he/she need not open a separate PMJDY Savings Account. Click here to download KYC documents submission requirement. Click here to download the account opening form. True to its new tag line, "Mile Yahan Dono Jahan", Saraswat Bank is committed to bridging the gap between technology and tradition by bringing to its customers the best of both worlds. Keeping tradition intact and embracing technology, the Bank has matched strides with India's digital revolution by offering various digital banking services designed to make banking more easy and convenient like mobile banking, internet banking, international VISA EMV and RuPay chip cards, etc. Simultaneously, through its emphasis on personalized attention, the Bank has maintained its personal touch with customers. Agility of the small bank with the ability of the large bank has been Saraswat Bank's enduring heritage new. © 2019 Saraswat Co-operative Bank Ltd. All Rights Reserved.